Every Mother Counts: What is a Midwife? With varying degrees of skill, education and responsibility, what exactly does it mean to be a midwife? In some countries, a local village woman who catches all the babies and learned her skills at her mother’s knee is called a midwife. In others, a trained birth attendant is a midwife. 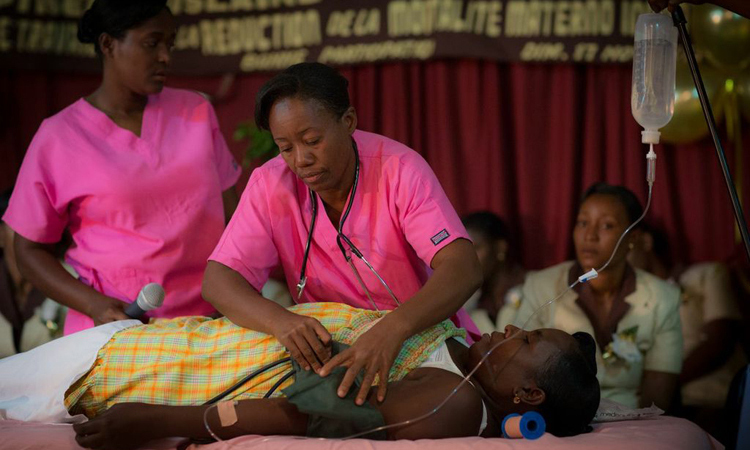 In Haiti where EMC has invested in training “midwives,” and in some other developing countries the term is used to describe a care provider with approximately a year or more of specialized clinical training to perform basic maternal and women’s health services. It’s that great variation in “who exactly is a midwife” that’s part the problem the world of midwifery is facing right now. Some mothers die because their “midwife” doesn’t know what she’s doing. Some “midwives” leave the profession or move to areas where there’s less need for her services because despite advanced training, her work isn’t respected or fairly compensated. It’s a problem international maternal health leaders are working to amend because development of nationally recognized training protocols to perform sexual, reproductive, pregnancy, childbirth, newborn and postpartum care at an acceptable standard is becoming increasingly essential to reducing maternal mortality. A midwife is a person who has successfully completed a midwifery education program that is duly recognized in the country where it is located and that is based on the ICM Essential Competencies for Basic Midwifery Practice and the framework of the ICM Global Standards for Midwifery Education; who has aquired the requisite qualifications to be registered and/or legally licensed to practice midwifery and use the title ‘midwife’; and who demonstrates competency in the practice of midwifery. It’s important to note that it’s a midwife’s skill level that determines her expertise, not necessarily the educational path she took to become a midwife. We know of exceptional midwives all around the world with both non-traditional and traditional educational backgrounds and licenses who are providing high quality care. We also know that many “midwives” lack the training and professional support they need and deserve to provide the skilled, responsible and desperately needed services they’re called to perform. That’s why EMC continues to support midwifery care and training in many of our programs around the world.